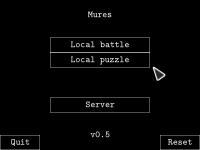 Mures is a cross-platform clone of Sega's "Chu Chu Rocket,"
a multi-player puzzle game. It is written in C using SDL. that supports multiple players per client. saves a screenshot to the shot.bmp in the current directory. Press escape to return to the menu from the middle of a game. F1 restarts the current game. This is useful in puzzle mode. to place an arrow. If a joystick is detected, it may also be used by player 1. Player 2: Use the arrow keys to target, and the number keypad to place arrows. 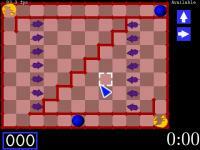 Player 3: Use A,W,S,D to target and I,J,K,L to place arrows. may press enter to start it.